At first I thought they were crazy, the people who told me they crawled out of bed well before dawn all to go watch a bird. Every spring sage grouse perform an elaborate mating ritual called “strutting,” or so I’d heard. The best time for viewing it involves arriving before sunrise. Don’t let the timing deter you and don’t wait as long as I did to check out this yearly ritual. The strut happens in March and April in the birds’ breeding grounds, known as leks. 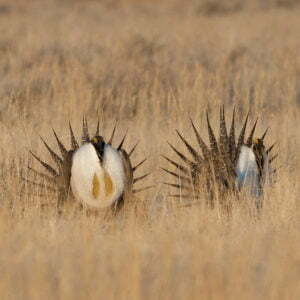 While sage grouse are often elusive, blending into the sage brush landscape from which they draw their name, leks are often in open areas to allow males to better perform for the females. It’s a chance to really see the birds and they are more beautiful than I’d imagine from the glimpses I’d seen before of one running in the sage. 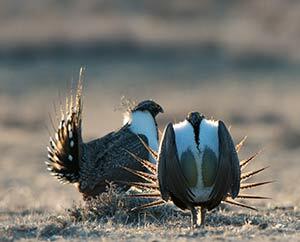 Often sage grouse are the center of heated discussion about grazing, development and energy. The birds’ habitat and populations have seen long-term declines. It makes seeing the sage grouse in their native habitat all the more special. It’s something anyone from outside the area should put on their to-do list while in Wind River Country in the spring, and something even locals get excited to see each year. “To see something so out of a National Geographic or Wild Kingdom- well it’s pretty cool to see that in person,” said photographer Scott Copeland. Copeland calls the birds “North America’s peacocks,” an apt name as the males elaborately display feathers to try to impress the females. You can see and hear the birds clearly and sometimes a lek might have dozens of grouse. Plus you are almost guaranteed to see the birds, unlike when you are trying for other wildlife and bird viewing. “You can pretty well bet they are going to be out there every morning,” Copeland said. Due to the fragile state of sage grouse populations, only a select number of leks are publicized by agencies. In Lander you can view a lek by taking highway 287 southeast of town for 8.3 miles to the Rawlins junction. Stay on Highway 287/789 for about 9.7 miles- 1 mile past Twin Creek Road. Turn left onto a pipeline road through a cattle guard. Stay on the right on a two-track road for about .4 miles to the edge of a clearing. The grouse strut in the clearing and east along the two-track road past the dam. Just because other leks aren’t publicized doesn’t mean you can’t watch if you know of another spot, but no matter where you go be sure to follow the tips in the link below on viewing ethics and etiquette. If you’ve seen the sage grouse, or if I haven’t convinced you it is worth rising before the sun, there are plenty of other bird watching opportunities in Wind River Country. The same diversity in our landscape that provides for an array of recreational opportunities also creates habitat for a variety of birds. 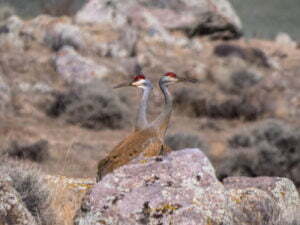 You can view birds year-round in Wind River Country. It’s a place many species stop over while migrating in the spring and fall. It’s also home year-round to some majestic birds like bald eagles, golden eagles and osprey. You can see birds throughout the area, said photographer Bruce Gallinger. Sometimes you need to hunt for specific species. But you can always find humming birds at the Visitor’s Center in Sinks Canyon and all kinds of varieties if you hike in the canyon. Sinks Canyon isn’t the only place; any of the area’s canyons will provide a variety of color and sizes of birds, he said. Basically you can see birds anywhere in the outdoors, and along rivers and lakes, in Wind River Country. The area is underrated for birding, Copeland told me. You just have to know where to go. That includes visiting Ocean Lake or Carmody Lake to see waterfowl, the canyons for songbirds, and sage brush desert for the raptors. You can see sand hill cranes and great blue heron. For those serious about bird watching, or looking to sight a specific species, you should check in with Wyoming Game and Fish (there’s an office in Lander) for up-to-date information on where to look. If you are a less serious birder, and more of just an appreciative viewer like myself, all you really need to do is look up.